US Secretary of State John Kerry has diverted his homebound flight from the Middle East for hastily arranged talks in Paris on the Ukraine crisis with Russian Foreign Minister Sergei Lavrov. The decision came after President Vladimir Putin spoke to President Barack Obama by phone late on Friday. Mr Obama has called on Russia to pull its troops back from Ukraine's border. Mr Lavrov told Russian TV on Saturday that Moscow had no intention of sending troops into Ukraine. 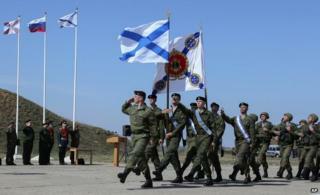 Several thousand Russian soldiers are reported to have been stationed near Ukraine's eastern borders. The two foreign ministers are due to meet in Paris on Sunday evening. Reports say Mr Kerry was flying home from the Middle East on Saturday when he abruptly changed travel plans and instructed the plane's crew to fly to France. There were festivities in the Crimean capital Simferopol late on Saturday when the clocks were moved forward two hours at 22:00 (20:00 GMT) local time to align with Moscow time. However, representatives of the peninsula's Tatar minority, who largely opposed Russia's annexation, voted in favour of "ethnic and territorial autonomy". The delegates at a congress convened in the town of Bakhchisaray left open the form this autonomy would take and how it would be achieved. Meanwhile, Ukraine's interim authorities have been pressing ahead with plans for elections due on 25 May. Boxer and leading political figure Vitaly Klitschko pulled out of the race for president on Saturday, declaring his support for billionaire chocolate tycoon Petro Poroshenko. "The only chance of winning is to nominate one candidate from the democratic forces," he told supporters of his Udar (Punch) party. Former Prime Minister Yulia Tymoshenko, who was freed from jail when Viktor Yanukovych was ousted as president last month, has also said she will stand. After Mr Yanukovych fled Ukraine, pro-Russian forces moved in to take control of the Crimean peninsula. Moscow then annexed the Ukrainian region after a referendum condemned as illegal by Kiev and the UN General Assembly. In an interview with state TV channel Rossiya 1 on Saturday, Mr Lavrov said: "We have absolutely no intention of - or interest in - crossing Ukraine's borders." He added that Russia was ready to protect "the rights of Russians and Russian-speaking people in Ukraine, using all available political, diplomatic and legal means". After the interview was broadcast, it emerged Mr Lavrov had spoken by phone to Mr Kerry, in a conversation that Russian officials said was initiated by the US. That call followed an hour-long phone discussion late on Friday between the US and Russian presidents. Mr Putin had contacted President Obama, according to US officials. The White House said in a statement. that the US was keen to de-escalate the crisis. "President Obama made clear that this remains possible only if Russia pulls back its troops and does not take any steps to further violate Ukraine's territorial integrity and sovereignty," it added. Media captionRussian Foreign Minister Sergei Lavrov: "We have absolutely no intention of, or interest in, crossing Ukraine's borders"
It is thought to involve halting the military build-up near Ukraine's border, the deployment of international monitors in eastern Ukraine to protect the rights of Russian speakers, and the return of Russian troops in Crimea to their bases there. The Kremlin said that the Russian president had drawn Mr Obama's attention to "the continued rampage of extremists" in Kiev and various regions of Ukraine. Russia's reported troop movements near Ukraine's eastern border - described by Nato as a "huge military build-up" - have triggered fears that Mr Putin's interest in Ukraine is not limited to Crimea. Acting Foreign Minister Andriy Deshchytsya said on Saturday Russia was trying to create an "instability belt" in Ukraine's south-eastern regions. "If you look at the map, there are plans to destabilise the situation in... particularly in Odessa, which would give the Russian Federation a pretext for creating a corridor between Russia [and] Crimea," Mr Deshchytsya said.